LOVING COUNTY, TEXAS. POPULATION = 82. I’m going to do a little skipping around on our Southern trip report – so bear with me. 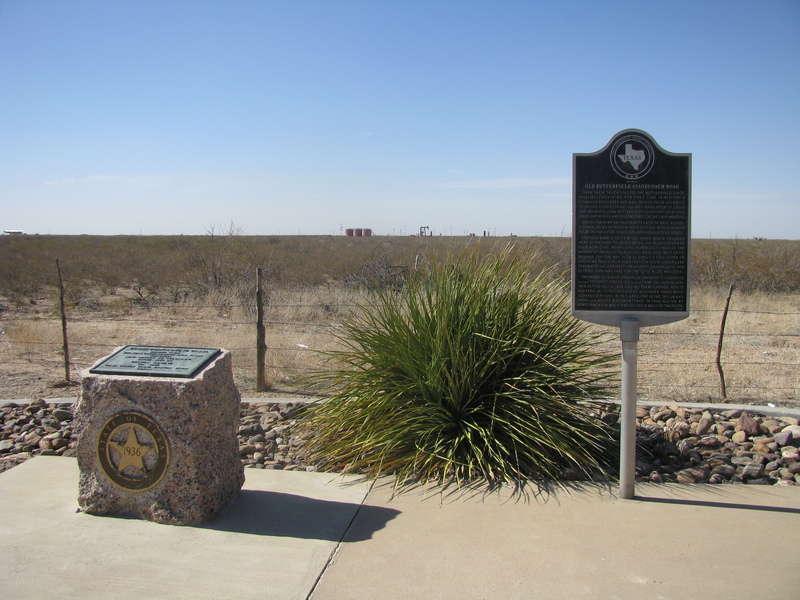 This little side “visit” to Loving County, Texas was remarkable for one reason – well, make that 82 reasons – and is worth a post all in itself. After visiting Carlsbad Caverns (and the nearby Guadalupe Mountains National Park) we drove down into the dusty Big Bend region of Texas. 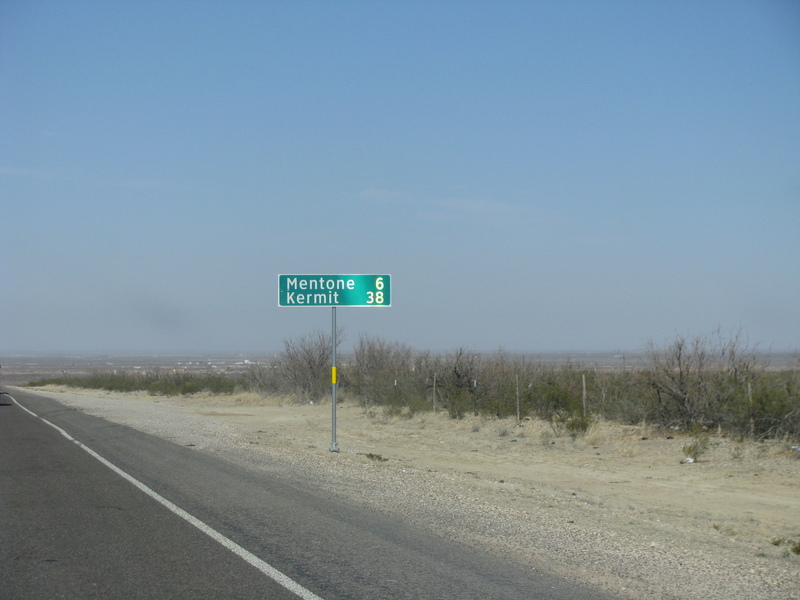 Instead of dropping down into Van Horn (we were headed for Marfa) – we headed east and onto Highway 285 towards Pecos. Loving County is just a stone’s throw from the highway and an easy drive into the county seat of Mentone. Or at least I thought it would be an easy drive. 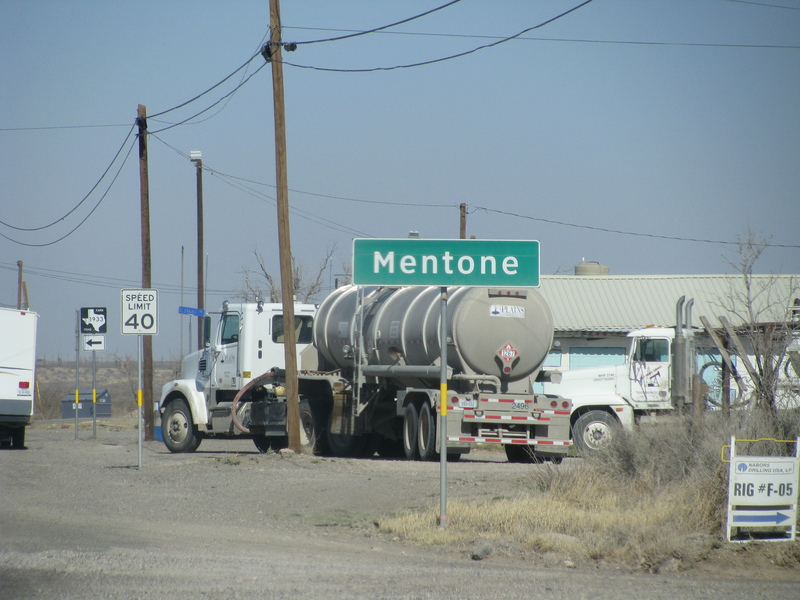 Apparently Mentone’s population (regularly 19 and the second smallest county seat after Brewster, Nebraska) at least doubled that day with all the truck traffic running in and out of the main drag through the town. I was literally the only car in a line of 4-5 trucks pulling into the county seat. 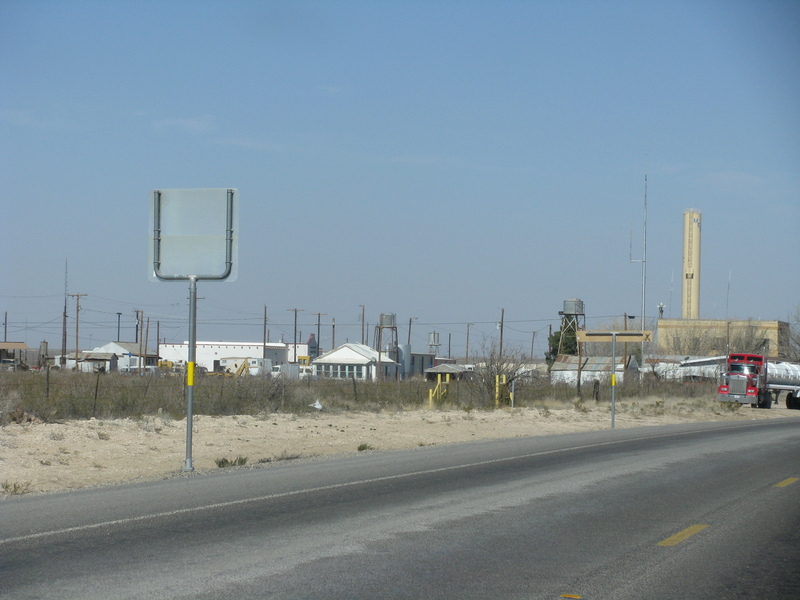 I understand oil drives this town (big surprise) but man, this place was hopping compared to the towns we’d seen on our more northerly route into Carlsbad just a few days before (namely Snyder and Lamesa). 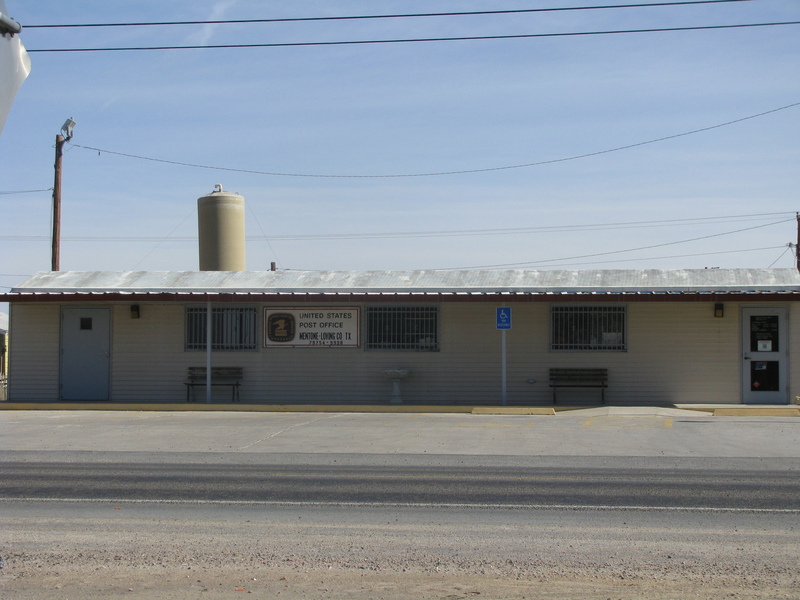 That said, Mentone has a nice-sized county courthouse, a post office tucked away inside a mobile home and a diner (which we assumed was part of the quite weathered (to be polite) service station. 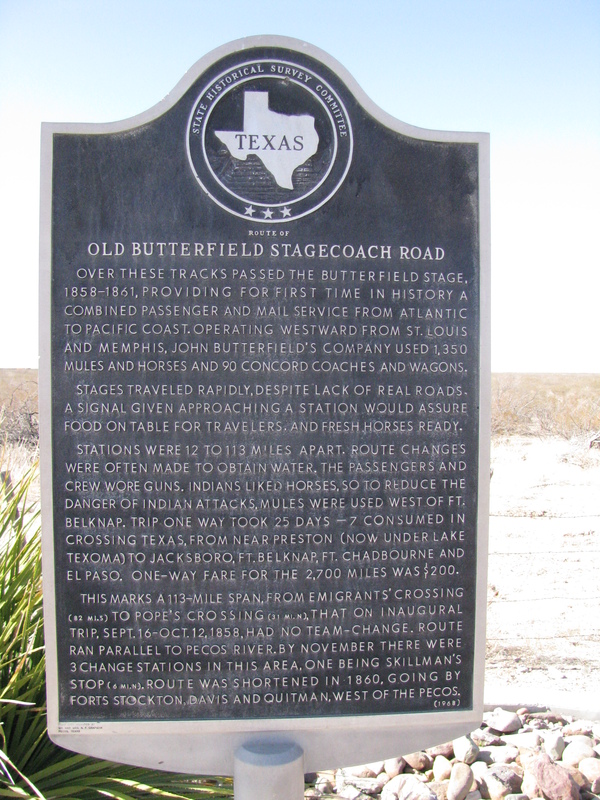 A nice little picnic area sits right outside of town surrounding a marker noting the “Old Butterfield Stagecoach Road” a the first ever cross-country service to combine passenger and mail service in one route. One must wonder of the perils awaiting these early roadies in trips that would take upwards to a month’s time. 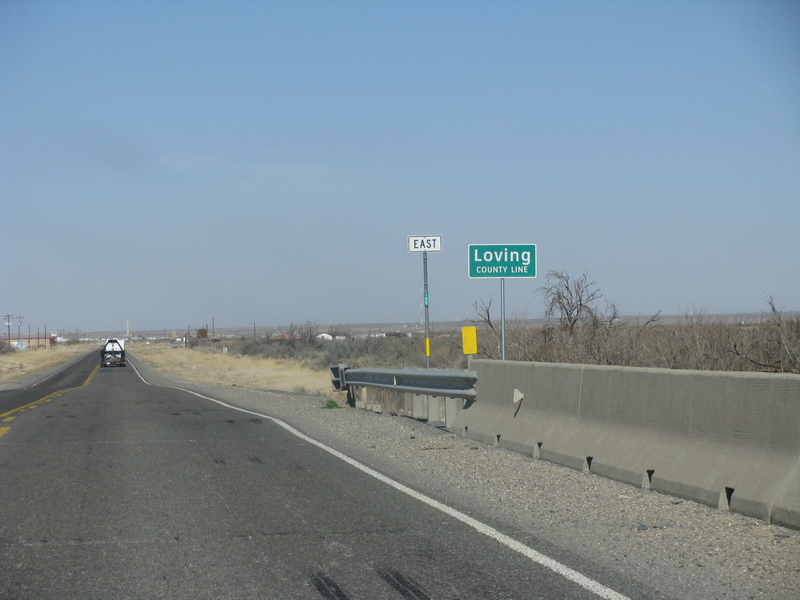 We peeled out of Loving just as fast as we came in – and a truck driver didn’t care much for us pulling out in front of him as he quickly gained on us and rode our bumper doing 80. He obviously had somewhere to be. All said, our two minutes in Mentone weren’t any more remarkable than for the fact we we’re possibly the first two people from our respective home towns to set foot in this place (I often wonder about that in many of the remote or oddball places we visit). 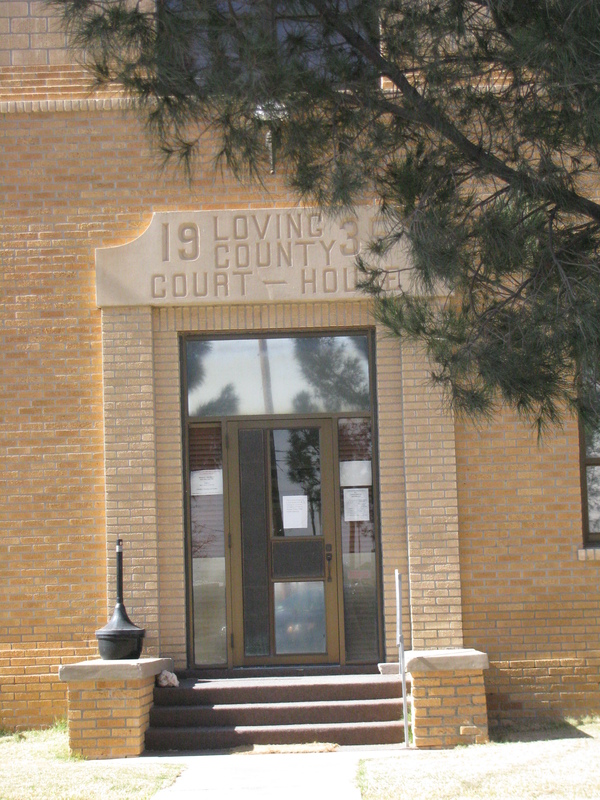 Crazier yet, though, is where do the other 63 people in Loving County live? 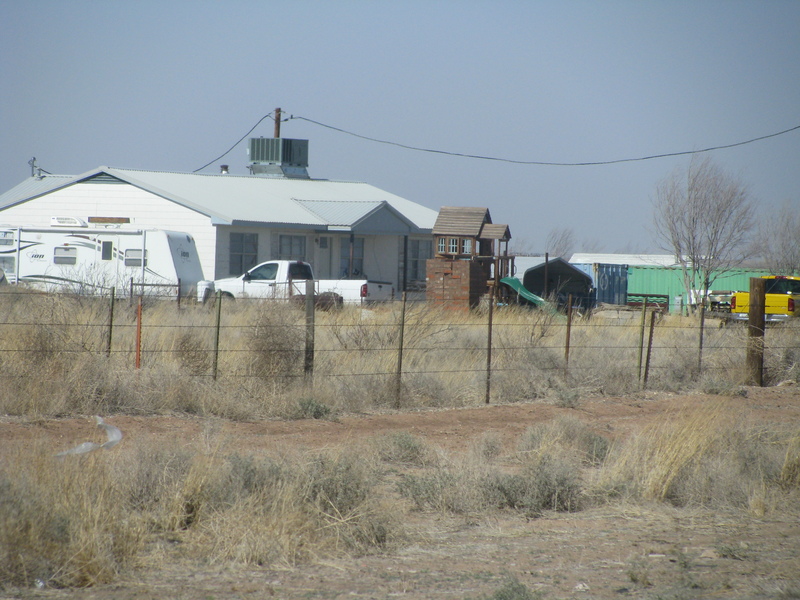 The dry land around the county is relatively lifeless and no homes or ranches could be seen in the surrounding area as we drove through. Make no mistake, though – where there is oil, though, there will be people…no matter how inhospitable it is. Howdy from League City, Texas. Nice report. I found you through the Twelve Mile Circle and have read your site for a while now. I had a similar experience in Loving county and Mentone. Luckily the truck drivers were decent. The whole area is quite unremarkable but for it’s status. I think my then-2-year-old slept the whole time. An 80 mph speed is not that fast out there. The vast distances really help the extra speed save time. I was frequently on my cruise control’s 88 mph speed limit if I wasn’t doing 90+. 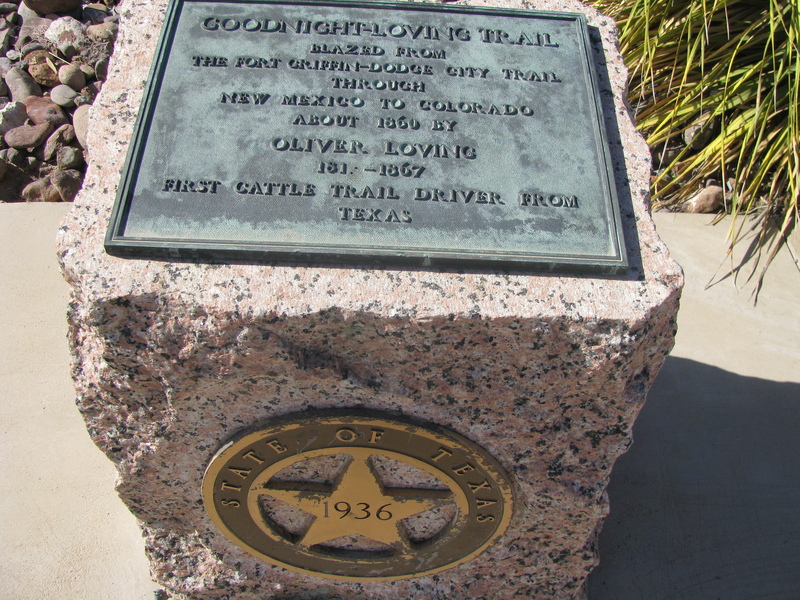 Thanks Mike – Yes, I guess as a first time guest of Texas, I couldn’t believe how large the state is. We had time to do the “Santa Elena thing” at Big Bend one day and had to long haul it up to Fort Worth for our hotel that night. 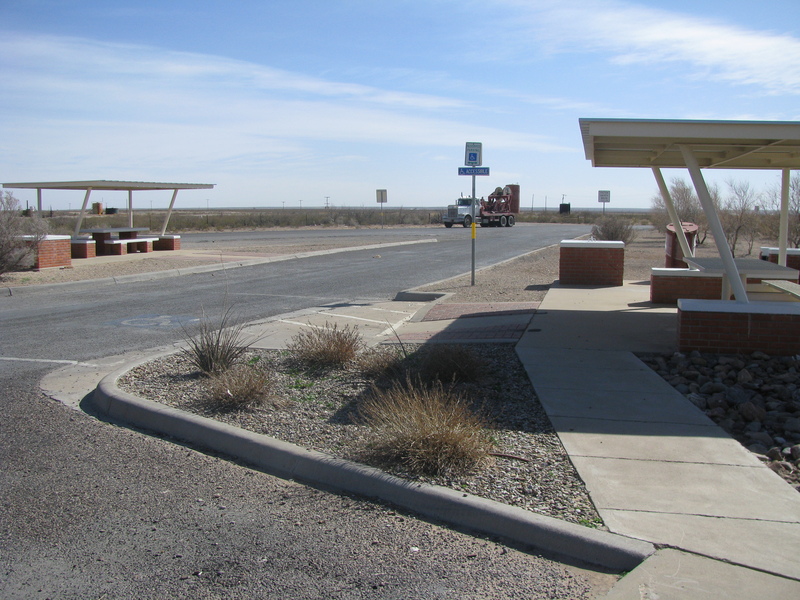 We left Big Bend a little after 1 p.m. and didn’t make it to the hotel until after 10 – about a nine-hour drive. I was cursing myself for not booking a stay in relatively closer San Angelo! Yes, and I’m not used to 80, even being originally from Montana, where the speed limit was thrown out for time. Around the east coast it seems lucky to see 70 – and you’ll count at least a dozen highway patrol manning their posts every time you trek across Virginia (I noticed the same in Oklahoma). 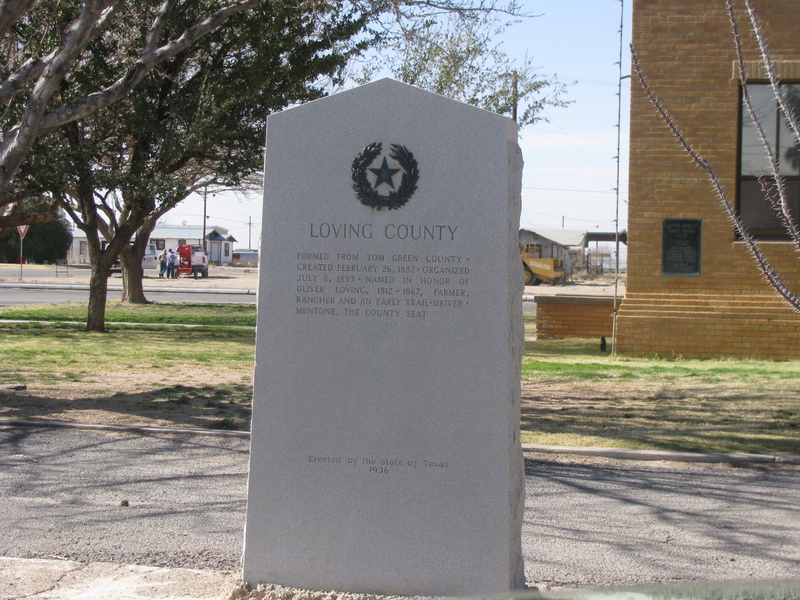 I really enjoyed your post as I was curious about Loving County, having lived in Dallas several years back. I must “drive through” sometime! I now live in Honolulu, whose state has the SECOND smallest county of 89 people. Kalawao County is often forgotten on the Islands, as it houses the survivors of Hansen’s Disease (Leprosy) and their families on a remote but beautiful section of the Island of Molokai (which is part of Maui County). The area is now a national park (where Saints Damien and Marianne cared for the sick) reachable only by plane (from Maui or Oahu) or horse. Its a wonderful trip for those interested in a unique, quiet, spiritual visit while in Hawai’i (but I strongly advise against the horse entrance; it is unbelievably treacherous, long and uncomfortable). I’ve heard of Kalawao and have wanted to make the trip myself (Take into account Niihau, Kahoolawe and the minor Hawaiian islands and the state has a lot of geographic anomalies to tag for visitation). Kalawao sounds a bit more scenic and interesting than Loving and of course leprosy settlement you mention is protected by the U.S. National Park Service. I’m hopeful to be back in Hawai’i soon (I had visited Maui last time) and make it up to Molokai. Although each island is different (sometimes vastly), you can only visit the six main islands of Hawai’i. (I prefer Oah’u and the Big Island, myself.) Ni’ihau is a Native family-owned Island that even the Governor needs an invitation to visit. It is “pristine” in terms of outside contact, disease, and species. You’ll only get to Ka’hoolawe if you’re in the military, and then think twice, as its used for bombing practice. The outer (not minor) Islands (including Midway, some 1200 miles away) are all closed to humans. Permission is granted to scientists and researchers there who study plants, birds and fish but there’s lots of red tape. You can volunteer to see on one of the atolls for six months and count birds! Trust me, there’s enough to see and do elsewhere! Of course “outer”, I was thinking of the U.S. Minor Outlying Islands when I typed that – of course none of those are part of the same chain as the Outer Hawaiians. You have a wealth of information on Hawai’i. The Ni’ihau tour that I researched is advertised at http://www.niihau.us. $385 per person for 1/2 day, minimum of five people needed. Not an easy trip to assemble. Of course, plenty of other interesting places in Hawai’i to visit otherwise! In your “tagging” don’t forget the CENTER of things as well. Center of states, countries, continents. I always wanted to visit Timbuktu (and because of ISIS will not now) because I define it as the “middle of nowhere” (at least in terms of literature and popular expression). Someday, maybe…but right now I’m working on visiting every nation in Asia and the South Pacific. I only have a few to go but financially need to take a breather for the moment. Finally, if you made it to Key West, you really should have continued to Fort Jefferson NP in the Dry Tortugas. It’s where Doctor Mudd was held after Lincoln’s assassination (which occurred 150 years ago next month) and from which the phrase, “your name is mud” comes from. Amazingly cool place. I actually scheduled a flight to Fort Jefferson that weekend I went and cancelled at the last moment because of some other financial matters that came up. I REALLY want to make it out there some day. The Mudd name is also popular around Georgetown campus (where I work) here in D.C. – his grandson graduated here. They like to throw that bit of trivia around on the campus tours. I hear you on ISIS effectively blocking out a whole swathe of travel spots, including timbuktu, but all the reason to continue your travels in Asia and the South Pacific (I’m hoping to get back down to that part of the world later this year – I’ve always wanted to visit American Samoa and the national park out there). As for the center of places – I think you got me hooked on a new idea for when I visit Minnesota again in a couple weeks. We might make the drive to the center around Brainerd just to tag it. Glad to help, Philip! Don’t forget the top and bottom of each state (by elevation), as your Mount Washington story observes. You are going to be very busy, I think. American Samoa (and the huge Pago Pago harbor, in particular) is fascinating and yet not. Its best reached via Honolulu and is very friendly, warm, and appropriately American (when it needs to be). However, it lacks a certain beauty you’d expect, the unemployment is troubling (like Puerto Rico), and after a day or two, you realize it is a very small, poor, isolated place (kind of like Saipan) and is in fact, a completely different Island culture (obviously, Samoan). So it is familiar and yet different. The NP is a hiking-type of place, which is fine if you’re there when its breezy and not too oppressively humid. I highly recommend taking a quick plane to the nation of Samoa next door (in a different day and time zone) to compare. As its so far away (and expensive), you probably won’t be back for awhile.